So, why do I blog? I thought it would be a story worth telling. This is my 173rd blog entry for calherewecome. I started this blog in May of 2012. I was two weeks away from my retirement from IBM/Sykes and a month away from closing on the sale of our house in Billerica. I was already an active participant on Facebook, but somehow Facebook didn’t quite make it for me. The posts were generally too short and ephemeral. And many of our friends and family just didn’t do Facebook. I needed a way to reach those folks who I thought would be interested in what was going on in our lives but I knew avoided Facebook like the plague. We were in the midst of planning retirement, selling a house, doing a trip to Ireland, and finally moving to California. We had decided to move to California to live with Paula’s aging mother who is 89. So we had the summer of 2012 to make all of this happen. The blog gave me a way to write down the events as they happened along with the pictures. We like to travel. I kind of wish that I had blogged back in the day when I was doing a lot of business travel. Blogging gives me the opportunity to share in our adventures. So at first, I knew most of the people that were reading my blog. Then something strange happened. I don’t know exactly when, but all of a sudden I was seeing comments from people that I didn’t know. Not a clue. It felt a little scary at first. But I got to liking it after a while. Some folks were actually interested in what I had to say. I blog from my laptop, my iPad, and on occasion from my iPhone. A lot of the blog posts from Ireland started on my iPhone and then were edited and polished on my iPad later at the hotel before publishing. I always try to add pictures. I also add links that give my readers an opportunity to read more in depth on a particular subject. Margaret and Helen – A blog written by two eighty something ladies in Texas. Usually left wing political discussion. LA to Z – Blog written by Natasha. Photo blog on out of the way treasures to be found in Los Angeles. That’s enough for now. One of these days I will update the blogroll listing. Happy Thanksgiving to all of our friends, family and readers. So it’s not Thanksgiving if you’ve not listened to Arlo Guthrie’s “Alice’s Restaurant”. 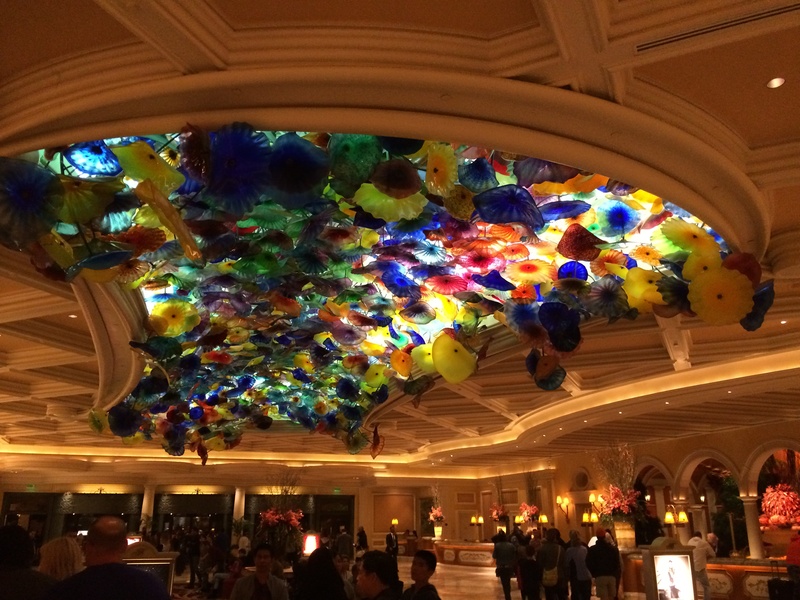 We just got back from a quick trip to Las Vegas. Our son and his wife had invited us a few weeks ago to join them for a quick trip to Las Vegas. Hotel rooms are a commodity that obeys laws of supply and demand. When the supply goes up the price goes down. So we found a relative bargain for Sunday to Tuesday before Thanksgiving. So we booked a room for about $125 per night at a hotel that normally runs for $250 per night. 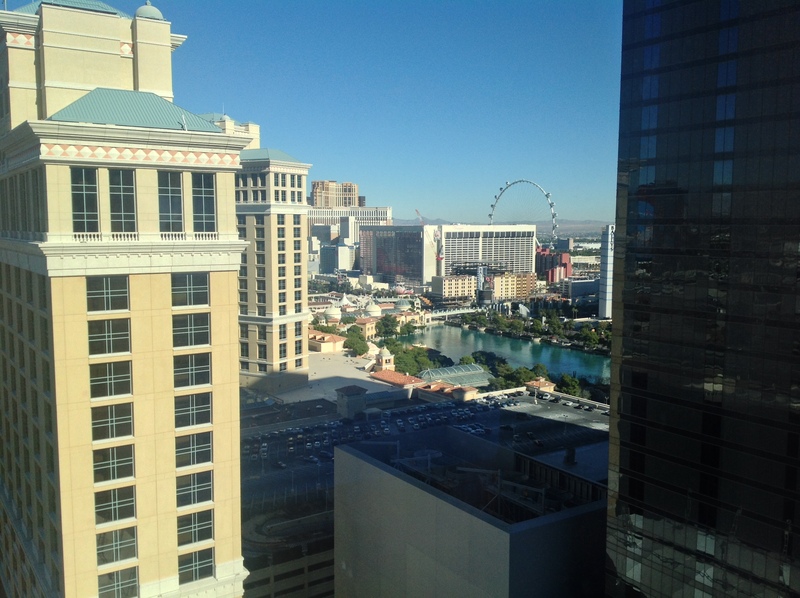 We were in a large room at the Hotel Vdara with a king size bed, kitchenette, a view of the Las Vegas strip. Here’s the view from our room on the 26th floor. One of the things that is unusual about the Hotel Vdara is that it doesn’t have a casino. Casinos are not far away though. 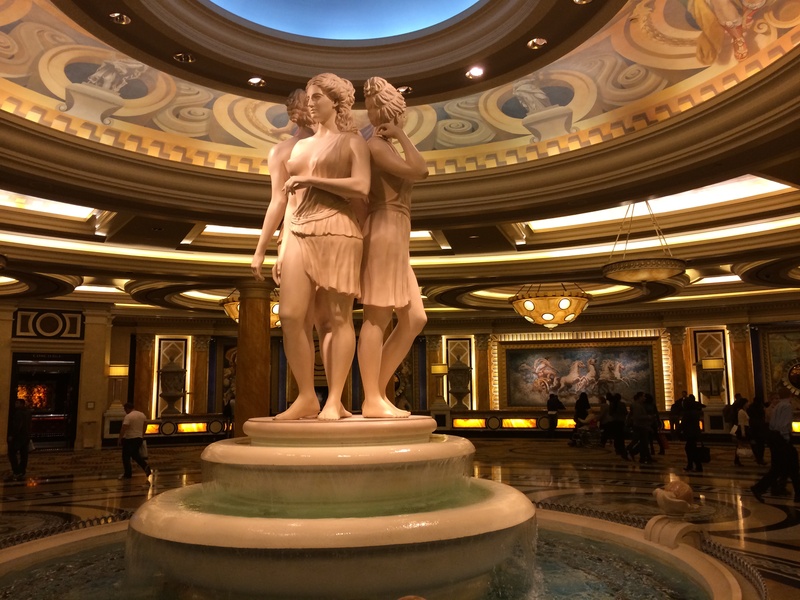 Short walk to the Belagio or a little bit longer to Caesar’s Palace. 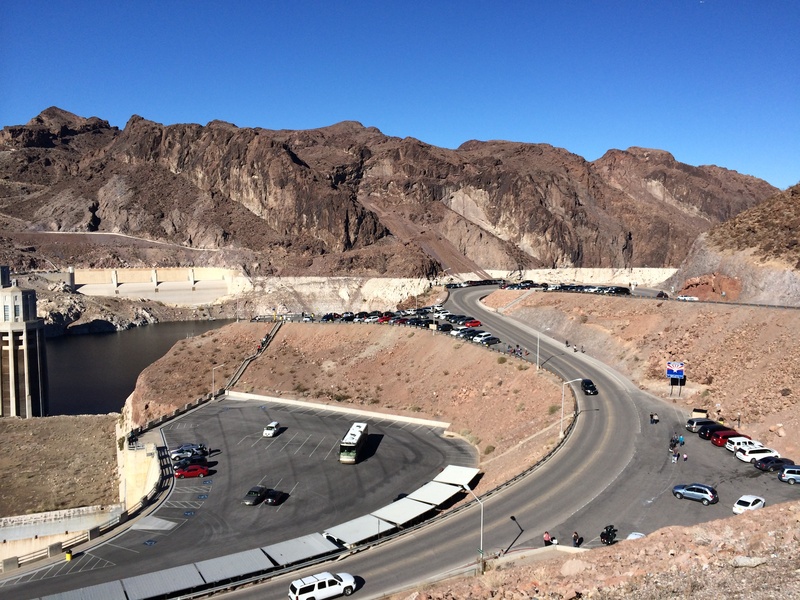 On Monday, we decided to take a ride out to see the Hoover Dam. Unfortunately, a lot of people had the same idea. Weather was sunny and clear. Visibility greater than 100 miles. We couldn’t find a place to park. We got a few pictures though from a couple of scenic pullouts. We are not much into gambling but there is lots to do. There are so many good places to eat. 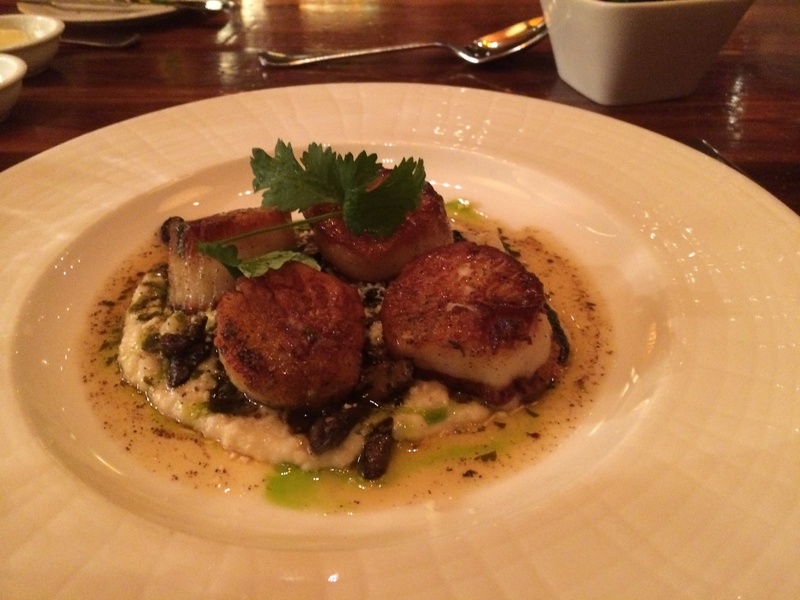 We ate at the Wicked Spoon at the Cosmopolitan Casino on Sunday night. just about anything you might want to try. Asian, Italian, American, seafood, you name it, they have it. 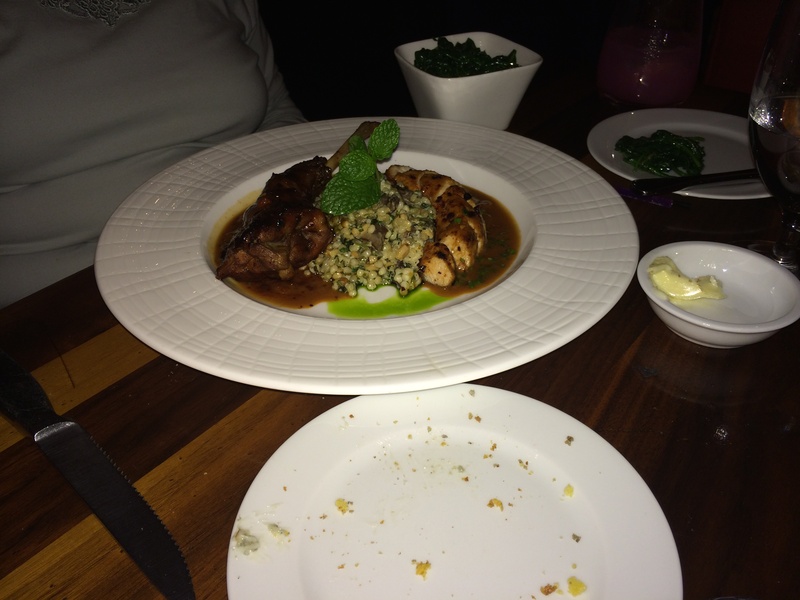 Monday we dined at Bobby Flay’s Mesa Grill at Caesar’s Palace. We had reservations for 8:30 PM for the four of us plus Jonathan our 2 year old grandson. Not cheap, but everything was outstanding. I had a Sea Scallop dish and Paula had Rabbit. (I know, the poor bunny rabbit) Good service and excellent food. Jonathan was oh so well behaved. He had some apple juice, but what he really wanted was the ice to chew on. Here are some pictures. After dinner, we all walked back to the Vdara by way of the Belagio. Half of the fun is watching the people and the art that is on display. 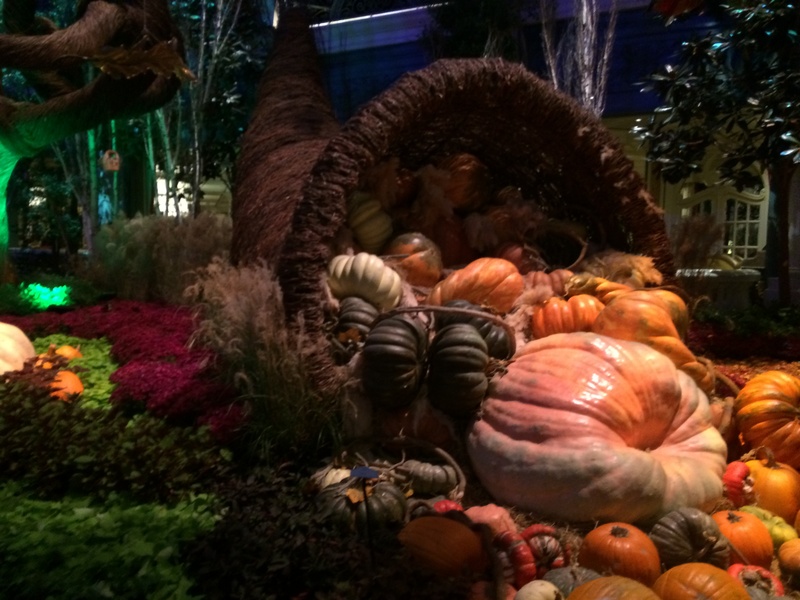 The Belagio still has their fall displays up. I am sure that will change quickly starting next week. 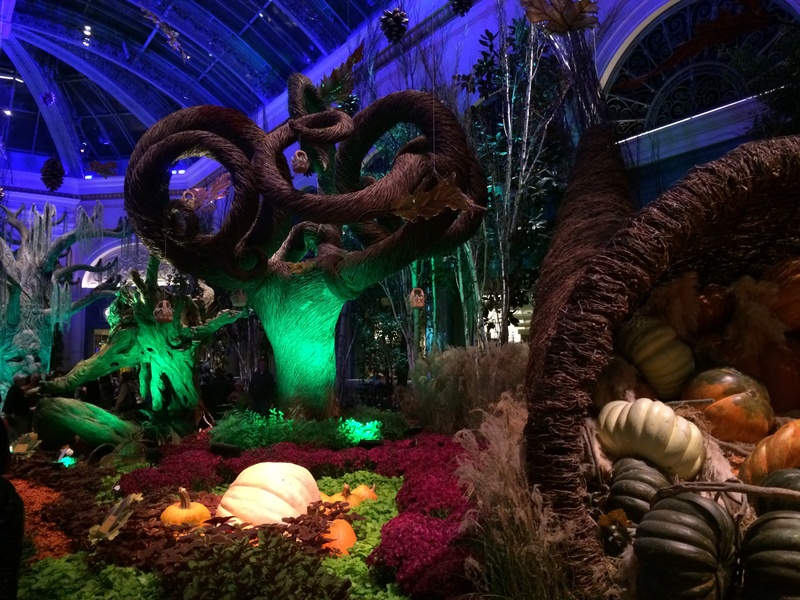 First here is the entrance to Caesar’s then the displays at the Belagio. 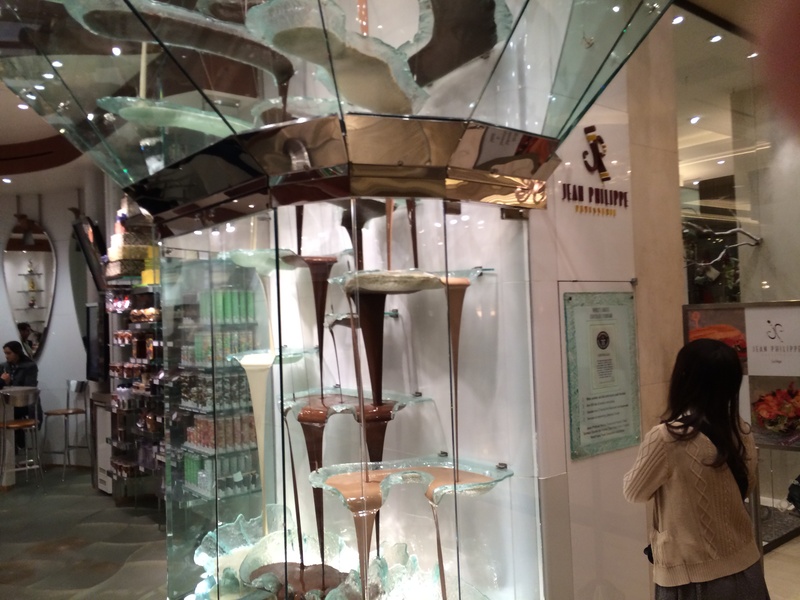 And finally for you chocolate lovers out there, here is the chocolate fountain at the Belagio Patisserie. 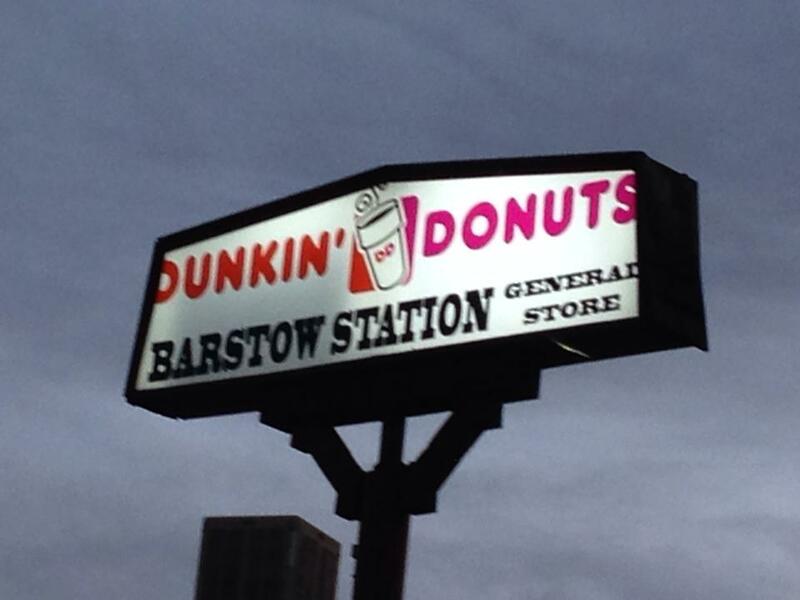 And one more thing, we have discovered there is now a Dunkin Donuts in Barstow (for our East Coast friends, Barstow is out in the middle of the Mojave desert, about 125 miles east of LA. For a while, the only Dunkie’s was at Camp Pendleton on the way down to San Diego. Slowly but surely, Dunking Donuts will come to the west coast. There is help. BTW, all pictures were taken with my trusty iPhone 5S. I wish everyone a happy Thanksgiving. Stay safe. Don’t overeat or over drink. We will be joining our daughter-in-laws extended family in Rancho Palos Verdes. Lots of family, lots of kids. Paula will be baking pies tomorrow. We have some good wines to taste. After Thanksgiving, I have to continue work on the 15th edition of my Christmas letter. We will not be doing black Friday. You couldn’t get me to the mall on black Friday, let alone any Friday. Okay, Joe, two posts in one day? How can that be? This is for all of my friendly followers. If you are anything like me at this time of year, you might be looking where to spend charitable dollars. We are constantly bombarded with US Mail from many charitable outfits. I try to find out how much of our donation goes to the actual charity’s operations. High percentage is good, low is bad. Nothing irritates me more than seeing as low as 20% going to operations and the rest to fill the pockets of the CEO. One of our favorites is Father Bill’s Place in Quincy, MA. Father Bill provides housing for the homeless. Father Bill is committed to ending and preventing homelessness in the South Shore (Mass) area. The meeting was held at the Limani Taverna (previously known as Papadakis Taverna). After lunch and brief business meeting we got to hear from Capt. Greg Williams, US Merchant Marine (ret). The subject was the US Merchant Marine in WW2 in general and the SS Lane Victory. 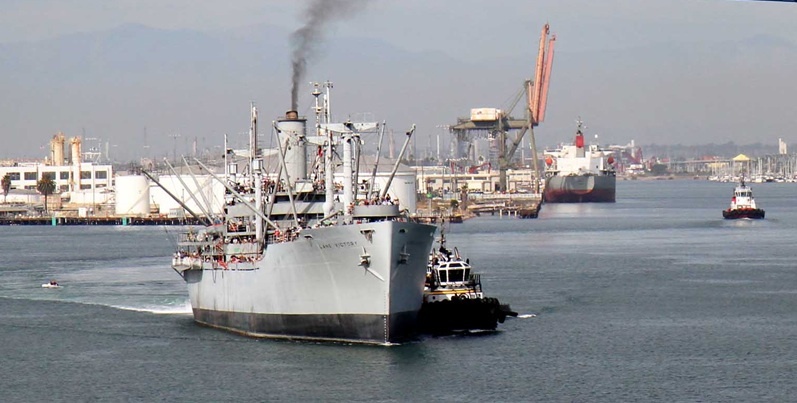 During WW2, the merchant marine was called upon to transport most of the supplies needed to run the war. Sometimes, new Liberty ships would not get far out of harbor before being sunk either by mines or German Uboats. Capt Williams told us the during the war, the press was prohibited from writing about the loss of Merchant Marine ships at sea. Indeed, the loss was great. The fatality rate in the Merchant Marine far exceeded that of the other services. Over 700 merchant ships were sunk during WW2. Click here for the wikipedia article on the Merchant Marine. 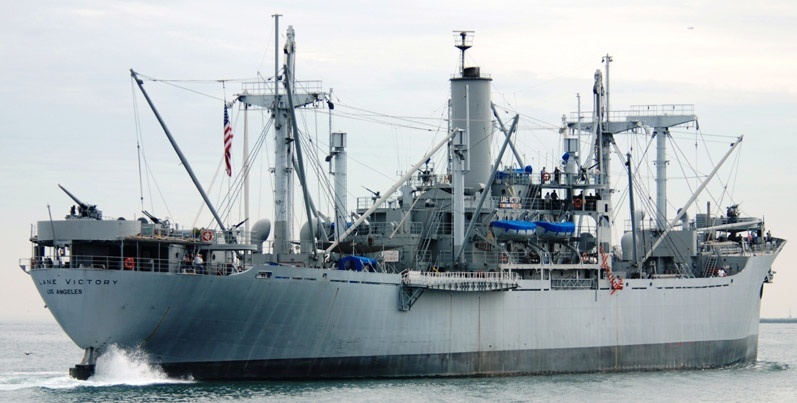 The SS Lane Victory is the last operational Victory ship in existance. The Lane Victory saw service in WW2, Korea, and Vietnam providing the delivery of much needed supplies to our armed services. It is moored at pier 49 in San Pedro. The Victory ships were much like their predecessors the Liberty shops. They were mass produced in shipyards around the country. The Victory ships were faster than the Liberty ships (making 15-17 knots) and had a longer range. This made them less vulnerable to Uboat attacks. Click here for the Wiki. The Lane Victory is open for tours six days a week (closed on Thursday). Admission is $5 for and adult and $2 for children. The Lane Victory runs several day cruises around LA Harbor each year. Donations and volunteers are much appreciated. It costs a lot of money to keep the ship operational. Every five years, the ship goes into dry dock for inspection, bottom cleaning and painting. The Lane Victory is scheduled for dry dock in 2014 and they have a ways to go to raise the $900K for the overhaul and inspection. For additional info, click here for the Lane Victory web site.